This information got lost years ago, or at least I can't seem to find it here on the Realm. Originally this was compiled in 2002 and posted here on the Realm, then updated in 2007. Mike asked me to re-post this, so I pdf'd my initial spread sheet and here it is for those who want or need the information - likely more than you'll ever need to know! The Z31 and 240z have the same strut angle as well. If anyone ever gathers more information- post it here and I’ll add it to the compilation for all the share. 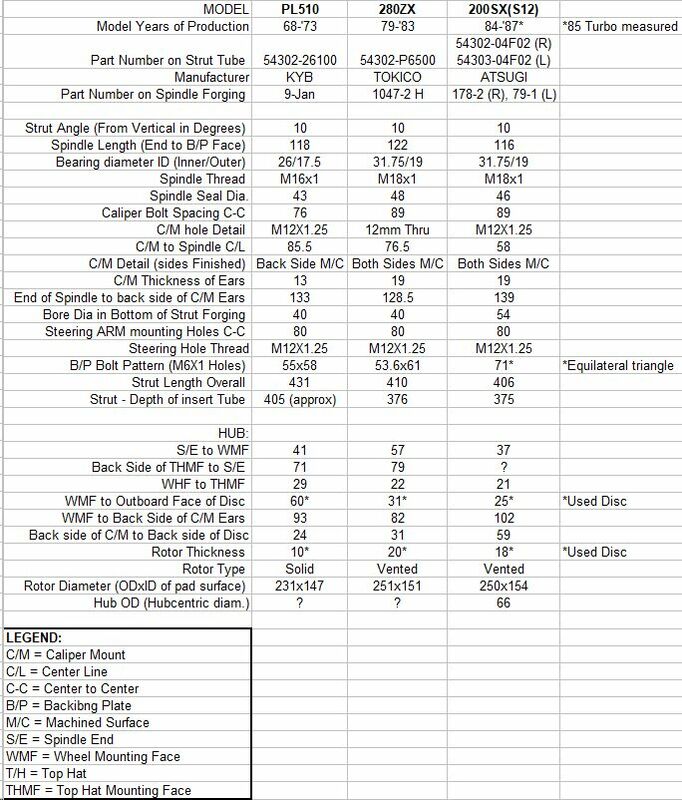 FWIW, I measured some S12 200SX struts and put it in the same format as Byron's measurements to compare with his PL510 and 280ZX measurements. These were '85 200SX Turbo struts with 4-bolt hubs. Vented rotors are within a few mm of 280ZX size. Brake calipers are similar to 280ZX but pad is slightly smaller. They fit inside my 13x7 zero offset Panasports but not my 13x6 +13 offset Superlites. Basically, strut tube is same length as 280ZX, same spindle angle, they bolt to the 510 steering knuckle but the cup in the bottom of the spindle casting has larger OD so some ring adapters need to be fab'd. Also, the wheel mounting surface is outboard by ~1cm vs. 280ZX struts, so more like stock 510 struts in that respect. 54302-N8400 are from? Just came with a car I got but he thought were 240z and they are for sure not. Spindle angle same as 280zx. I'm guessing a diff year 200sx ? As it's not in that sheet. They're almost 2.4" longer than a zx strut. 54303 is the LH strut. It has bearings same size as 280zx. Well it's a right hand side number. The '80 S110 200sx has an N8426 which is as close as I can get. The N8400 number does not come up on my data base. The last two digits 00-19 is a 'Similarity' code. Indicating that the part is only slightly different such as a different color or material but essentially the same. Maybe it was previously replaced by a dealership?? ?